ChefVille Guide: Prize Level 3 Unlocked! 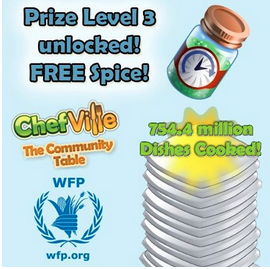 Over 750 Million dishes have been cooked by ChefVille players. Prize Level 3 has been unlocked and it is a free One-Hour Thyme! We are almost at the 1 Billion mark, which means that it is much closer until Zynga donates to the World Food Program. Please comment below if there are any other ways of getting these Prizes in ChefVille. Thanks For Reading!